Salsa is at the heart of Mexican cooking! It can liven up most dishes and add that much-needed kick. This flavourful combination will get your party started and is sure to bring you a lot of compliments! You won’t believe how tasty this recipe is. Its a very simple dish to make at home and takes very little prep time. The art of Mexican cooking is to taste as you go, so you can really understand the flavour combinations and add to your recipe according to your tastes. What we are aiming for with this recipe is a good balance between spicy, acidic, and mildly pungent. Today, we are posting a recipe for a more chunky style salsa, which means you won’t need to use a blender. All you will need is a very sharp knife, a decent sized bowl and the ingredients listed below! 2 cups tomatoes, 1/4 cup red onion, 1 red capsicum (green is okay too), 1 teaspoon minced garlic, cilantro, paprika, salt, and lemon juice. Combine the tomatoes, onion, capsicum in a bowl. Add the garlic slowly. 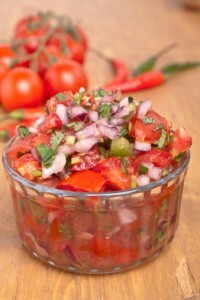 As you taste your salsa you will notice the addition of garlic really enhances the flavour. Still, go slow with it until you get to a taste you like. Add a generous amount of finely chopped cilantro, and paprika. Taste as you go. Finally, add the salt and lemon juice. Only a small amount will suit most people. And remember, since your salsa is already acidic (the tomatoes) you will only need to add a small amount of lemon juice. Some people prefer to substitute this with some vinegar. Mix and serve! Mexican cooking at its finest! Don’t forget to come visit us at Fiesta! Our staff are very friendly, and if you ask (shhh! ), they will give you some pretty decent tips on how to cook Mexican!